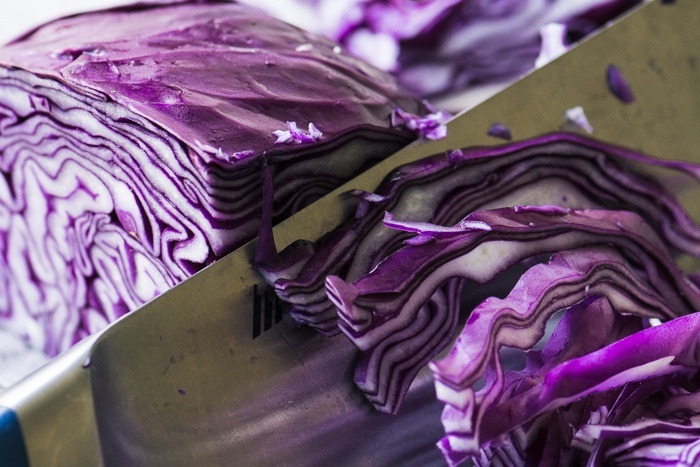 Braised Red Cabbage might not be the most glamorous dish on the table, but it provides a perfect sweet/tart element that brings everything else to life. Rinse the cabbage, cut it in half and remove the white core. Cut it again into quarters. Slice the cabbage as thinly as you can. Put the oil in a large, heavy bottomed pot. Add the cabbage, the diced apple, brown sugar and 4 tablespoons of vinegar. Bring the pot to a simmer, stirring often. When the cabbage begins to release its moisture, cover and continue to cook gently for about 20 minutes, or until the cabbage is just tender. Taste and add more vinegar as needed. Serve hot, with salt and pepper to taste.